Around the turn of the millennium when Sonic Team was in its prime with releases such as Sonic Adventure and Phantasy Star Online, Nintendo's Game Boy Advance was fortunate enough to receive a port of the Dreamcast title, ChuChu Rocket! Released in 2001 alongside the launch of Nintendo's latest portable system at the time, the action puzzler from Yuji Naka - the creator of Sonic the Hedgehog - required players to direct space mice (known as ChuChus) around stages and into rockets by dropping directional arrows on the board before space cats (known as KapuKapus) caught them. Now, in exciting news, the GBA version of the game will be making a return to Japan later this month on 21st October, with a digital release on the Wii U Virtual Console. The title will be priced at 720 yen and require 200 MB to download. The Game Boy Advance version of the title includes the original 100 levels as well as 2,500 user-submitted levels from the online service. There is also a brilliant single-cartridge multiplayer mode included which is unlikely to be accessible in the Virtual Console version of the game. Tell us in the comments if you're excited to see the return of ChuChu Rocket! and if you would like the Virtual Console edition of the game to receive a western release. Still a cartridge I treasure for my GBA, though I'd still rather have it on the go. Like a lot of the GBA and DS titles, I don't think I want if for the Wii U. Awe man...I was really hoping for a dreamcast port...must have read wrong. 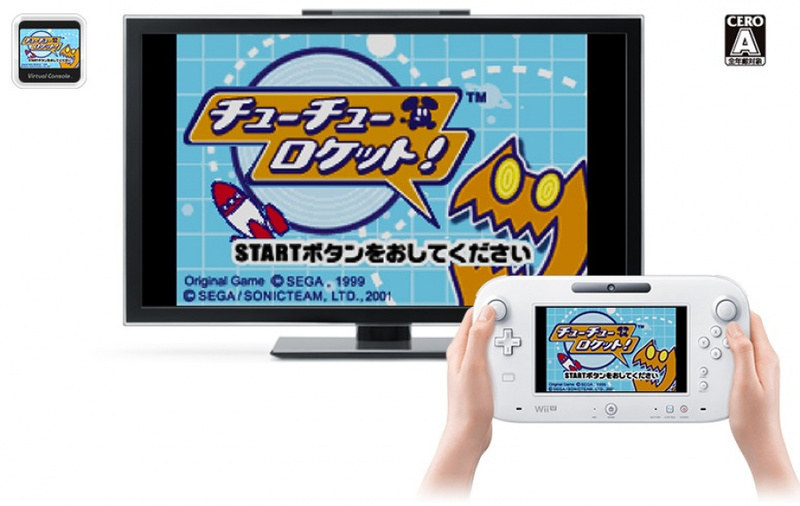 Still think dreamcast virtual console,while not as good as gc virtual console,would be pretty freaking great. I had some good times with the Dreamcast version. My favorite video game commercial of all time! Never played the game, but this is on the list of the data mined game releases that has supposedly leaked. Adds a bit of credence to it. Hopefully the list is real. So many games on there i want digitally. I played this game and wacky races on my dreamcast FAR TOO MUCH when I was little. I just woke up and read the title as the Dreamcast version was coming,I contemplated the incredible titles that may come after while I as making coffee only to feel disappointment when I sat down and read it's the GBA version.I still remember the day this arrived to my door,sent to me by Sega for free.I can't remember what the conditions were to qualify for a free version,it might have been through a magazine article.Any UK Dreamcast owners remember? @OorWullie yeah I remember too you got it free was it to do with the official magazine or something? Great little game on Dreamcast, never played this GBA version myself. @ss3_kakarot What else was on there? I loved chu chu rocket on the DC and this version is great as the puzzle mode really adds a lot. Thing is the multiplayer really makes this game special so whilst I'll still buy it (how could you not!?) it wont be as good as it could have been if theres no way to implement that multiplayer mode. @ss3_kakarot The list of games is completely real. No rumor involved with that at all. They're all on the Nintendo Update Server. Nothing gets added to it unless Nintendo intentionally puts it there. I hope so. It's the Twilight Princess HD reference found at the same time that is the most exciting. If one is true then hopefully the other is. Time will tell but we're certainly due some unexpected surprise positive announcements. Fingers crossed. I just logged into the Japanese eShop and saw the announcement. I was absolutely obsessed with the Dreamcast version (and even though I don't have a system to play it on, I still have the game), to the point where I was ranked #3 in the world (in stage challenge mode, mind you, not battle), and even created a soundtrack album. Then the GBA version came out and I bought the system for the game. I managed to solve 2499 of the user-built puzzles, and absolutely refused to resort to using the internet for the last one. But then I loaned the cart to someone and sadly never got it back (though I still have the box). But now it will live on in my WiiU! YAAAAY!!! ...sorry for the long, boring story to anyone that actually read my long, boring story. Totally thought it was going to be a dreamcast port. Put GBA in the title NL. Hopefully Sega and Nintendo will allow for the Gamecube version of Phantasy Star Online to be released as an eshop title with access to a new server and with updated internet connections. It was my alltime favourite Dreamcast game and the Gamecube version was very well done as well. You know what? I've been asking for this since we started getting third party GBA games. I've got the original for my dreamcast, but those extra levels are a nice bonus. I wonder if we could ever get a port of Sega Swirl and Snail Maze. Come on, Nintey, this game would be awesome if we could get it on the 3DS without hackery of homebrew emulators. Very positive to see SEGA fully supporting the VC, as a publisher at least not bringing the Mega Drive or Master System over, but should mean the likes of the other GBA Sonics, Gunstar Future Heroes, and heck at some point their DS games will come to the service. I must have spent two hundred hours on this game on my GBA. Seriously one of my most played games ever. I played it off and on for 10 years. So many levels it'll make your head spin. Plus I used to compete for speed run times on the challenge levels. I will definitely be getting it when (and if) it comes to the NA virtual console! I have the cart with the box and manual. Awesome game. I also have the android version. I like the sheer number of puzzles included, form the community in the DC days.